Forty classic rides through the region's quintessential scenes * With its spectacular and varied scenes, no other region of America can best the Pacific Northwest when it comes to motorcycle touring whether a Sunday afternoon ride with friends or a multiday adventure. 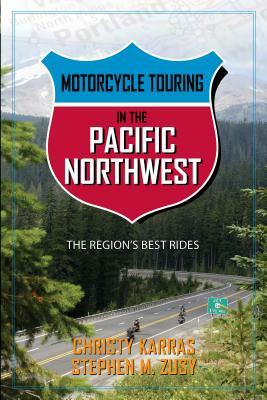 Now, with Motorcycle Touring in the Pacific Northwest, bikers have an unparalleled guide describing forty classic rides across the quintessential landscapes of Oregon, Washington, and Vancouver/British Columbia from the rugged Pacific coast to breathtaking islands, from rain forests to deserts, from the Cascades to the Rockies. In friendly prose peppered with anecdotes, sidebars, and interesting asides, Christy Karras and Steve Zusy describe the routes most representing a day's worth of riding and include a map for each, color photographs, and details aplenty on road conditions and terrain, sites worth stopping for, amenities, and side trips. Christy Karras has written about the arts, outdoors, and travel for publications including the New York Times, Salt Lake Tribune, and Seattle Times, and revised and updated Scenic Driving Utah, 2nd edition (FalconGuides). Whatever she is doing at this moment, she would rather be motorcycle touring. Stephen M. Zusy has worked as a photojournalist at the Park Record in Park City, Utah, and the Salt Lake Tribune. There's no place he d rather be than on the back of his motorcycle, twisting back the throttle, headed for somewhere. Christy and Stephen previously collaborated on Motorcycle Touring in the Southwest (GPP Travel)."